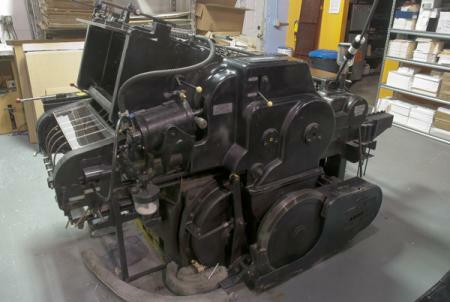 Spark Letterpress is undergoing some exciting changes that leave us without room or need for one of our letterpress printing presses, a Heidelberg KSBA, located in our main printing facility in Sioux Falls, South Dakota. We currently only use the KSBA press for light die cutting. Before we purchased it, the machine had one owner in Brookings, SD. 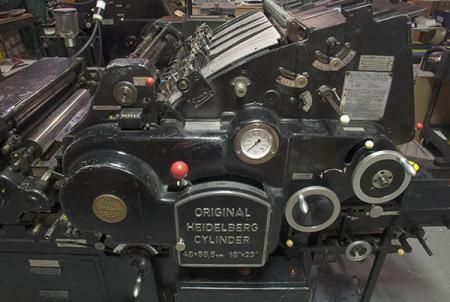 The inking unit is present, and there are 5 of 6 roller cores with the machine. It did not come with the rider roller or holders. Price includes Bar-Plate die cutting jacket. Recent maintenance includes full cleaning of air pump and its reed valves, and removal of feed board to clean beneath, thoroughly re-grease and oil. We also replaced the hinged delivery guard, and installed a new drive belt and brake shoes. 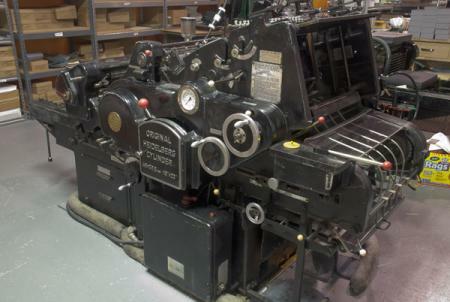 Press has been used weekly and is well-maintained. 220V, 3 phase power. Asking $9,500 or best offer. Price does not include shipping or any applicable taxes. Depending on your shipping needs, we may be able to assist you in making the arrangements. Email Valerie with your questions or to make an offer. Additional photos are available upon request but please let us know which area of the press you would like to see. You may also call 612 220 0930 between 9am and 5pm Monday through Friday to speak with Valerie or Jim in person. We’re happy to answer any questions you may have.